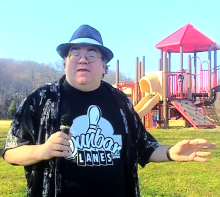 Host segments were shot at Joplin Park in South Charleston early on a Sunday morning, just moments before gloomy clouds and rain blew through. We’d decided to do something with this episode that we hadn’t done since our very first year, and that meant taking a quick look back at some of the memorable performances that we’ve been lucky enough to have on our show in the calendar year, 2012. Of course, with us re-presenting these shows every week, now it’s more like the best of the previous seven months. But still, it’s a great batch of terrific local music, so enjoy. Next week it’s Christmas in March.